Video-playing basketball, square basketball and basketball net skull cap hit hot list of March Madness products to jazz up any company promotion or to reward office pool winners. “Heat up any company, bar, restaurant, sports team or booster club promotion or brand campaign with promotional products that tie into tournaments averaging 9 million viewers per game,” said Timothy M. Andrews, president and CEO of ASI. The Advertising Specialty Institute (ASI) today bet on massive interest in season-ending basketball tournaments with a hot list of March Madness promotional products. The NCAA March Madness tournaments continue through April 2. Millions fill out a bracket predicting winners from 68 teams. Click here for product video, photos and descriptions. 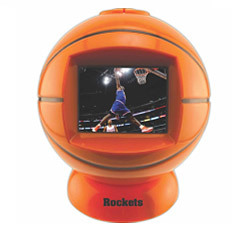 Video-playing basketball, from CleggPromo. Users upload any video, making it a perfect prize for top performers in the office pool. Logoed spatula, from Sportula. Relive tournament highlights this summer with spatulas die-cut with a school or booster club’s logo. Device wraps, from Skinit. Users upload their own picture and wrap their favorite device with college mascots and logos. Basketball net skull cap, from Bodek and Rhodes. Tie into the tournament with pop-a-shot contest between games and give winners fun items like a funky cap. Basketball jersey, from A4/Moshay. Companies can host three-ball competitions and giving away adult-sized moisture-wicking jerseys to organizers and winning teams. Square ball stress reliever, from Impressline. Perfect for squeezing during down-to-the-wire games. Mini backboard and ball set, from MAC Specialties. Businesses can send reps armed with great giveaways for clients to encourage them to join office pools. Basketball helmet, from Spirit Industries. Beverage companies can use as an on-pack promotion for college kids or to reward employees during a company appreciation event.